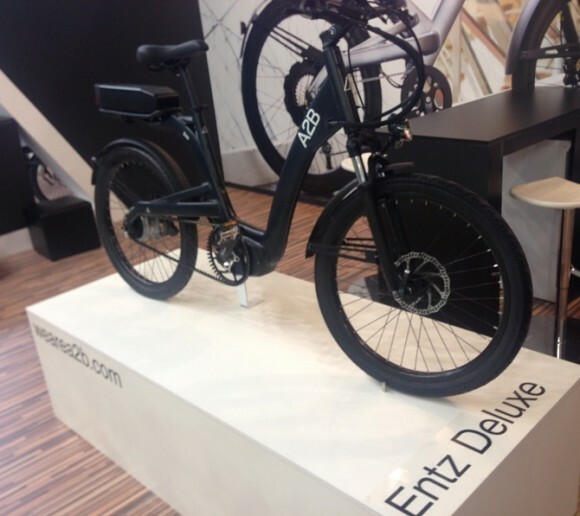 > A2B continue to redefine journeys with Entz launch at EUROBIKE show. Pioneers of the eBike industry, A2B, will unveil the latest development in eBike design and technology at the upcoming EuroBike Show which takes place from 27 - 30 August in Friedrichshafen, Germany. Named after the American inventor of electromagnetic transmission, Justus B Entz, the newest bike in the A2B range continues their tradition of unrivalled design, innovation, quality and performance. The top of the range Entz combines the best pedal assist support and smoothest ride experience with a range of up to 100km and a maximum supported speed of 15.5mph (25km/H). Its highly appealing look is available in either black or white. The most significant development is the integration of the revolutionary new CONTI® eBike system from Continental, the Entz being the first bike to feature the technology. A2B General Manager, Fernando Kuefer, said: “A2B is renowned for redefining journeys and the Entz is the latest embodiment of this. The striking design and robust German-built frame provide the ultimate in looks and quality whilst the CONTI system from Continental delivers true performance. The CONTI® system is a complete drive structure comprising of a motor, display, control unit and battery. The premium system is smaller, more powerful, and weighs less than any other concept available. Weighing just 3.4kg, the compact motor is integrated within the frame. As a result, the system engages with exceptional smoothness, providing a much more comfortable ride. The backlit display on the handlebars gives the rider realtime feedback on their speed, distance, range, power and battery status. The Entz is available in either standard of deluxe versions. The standard Entz has a Shimano manual gear changing hub, while the deluxe version offers the ability to use either automatic or manual settings on a gearless hub, and the convenience of having no chain to maintain.